What's better gift than baking your own Chocolate Chip Cookies to thank the teachers? 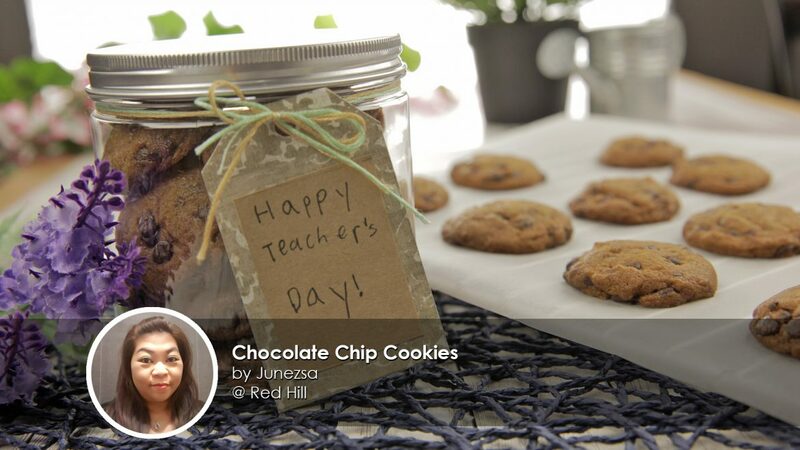 These simple to bake cookies are sure to melt the hearts of your child's favourite teacher! Home baker Junezsa is a mother of 2 lovely daughters and they love it when she bakes this cookie! The aroma will fill the house and they will run to the kitchen to help out. The dough is easy to handle and it doesn't stick on hands. Hence, allowing the little ones to roll them into small balls or molding it to their favourite shape is a great way to bond. To all Teachers, we wish you a Happy Teacher's Day! Thank you for all your hard work in grooming our future generations. 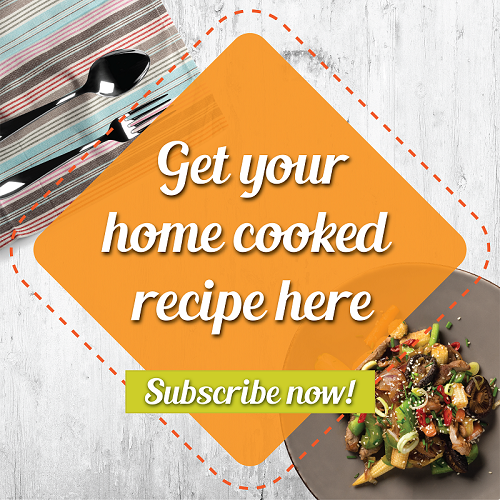 In a mixing bowl, sieve in plain flour, corn flour, baking soda and salt to remove any lumps. Set aside. In the mixing bowl, add in softened butter, dark brown sugar and castor sugar. Attached the bowl to the mixer and beat on medium speed till it becomes fluffy and light in color. Add in egg and vanilla extract to the mixture. Continue to beat at medium speed till well combined. Use a spatula to scrape down the sides and the bottom of bowl. Reduce to low speed, add the flour mixture to the dough a tablespoon as a time till evenly mixed. Lastly, add in the chocolate chips and mix it evenly with a spatula. Cling wrap and place it in a chiller for 2hrs or 1 day. Remove cookie dough from chiller. Let it sit in room temperature for 5-10mins before working it. Preheat oven to 170°C for 20 minutes. Line your baking sheet with baking paper. 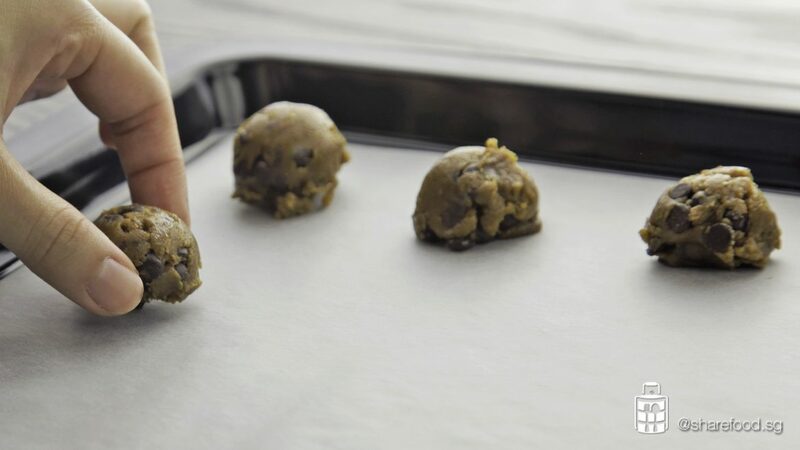 The cookie dough is easy to handle and not sticky, roll them or use a small ice cream scoop to make them into small individual balls and place it on the baking sheets. Note: As the dough bakes, it will spread and increase its diameter by approximately 2 times. Hence, do adjust the size of the dough ball accordingly to achieve the desired size of your cookie. Bake for 10-14 minutes or till golden brown. 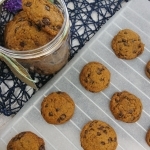 The cookies are extremely soft after removing from the oven. Let them sit for 8 minutes in room temperature on the cooling rack before touching it.